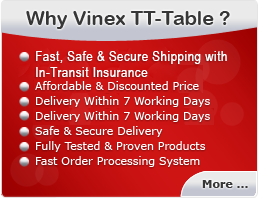 Vinex Soccer Table - Stylus top surface is made of laminated MDF board for extra durability. Playing rods are made of hollow construction with chrome finishing. Its base frame is also made of laminated MDF board. Levelers are available for level adjustment. Easy to install and occupy very less space. This table is especially designed and perfect for Sports Clubs, Universities & Colleges, Home and Corporate Offices. It is mostly played by all age of people. Its boundaries are printed with Soccer and football graphics to make it more attractive.